Please refer to our stock # MOR6904 when inquiring. 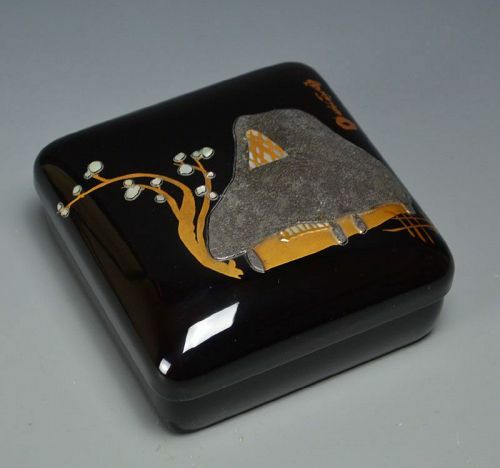 A lacquer box decorated with a Rimpa style thatched house under blossoming tree by Kamisaka Sekka dating from the late Taisho period. It is 12.5 x 12.5 x 6 cm (5 x 5 x 2 inches) and is in excellent condition. An identical box which was part of the permanent collection of the Ruth and Sherman Lee Institute along with the original design sketch is visible on page 154 of the book Kamisaka Sekka: Rimpa Master - Pioneer of Modern Design published by the Kyoto National Museum of Modern Art in 2003. Kamisaka Sekka (1866-1942) is the godfather of 20th century Japanese design and the Rimpa revival. He was born in Kyoto in 1866, one of six siblings. From 1882 he began his artistic career, however did not take-off until visiting the Paris Expo in 1901, where he was exposed to Art Nouveau and Western industrial design concepts. He was adept as a painter and designer in an assortment of other media, working with various artisans to bring to life his ideas. He was employed as a teacher at the Kyoto Municipal School of Art (future University of Fine Art), and was widely exhibited and prized throughout his career, which ended in retirement in 1938.